A stylish refillable leather notebook, made from premium Italian full grain leather. Features a fully integrated leather penholder and strap with a metal button closure. The back flap is designed to allow full functionality of the refill's elastic strap. Also includes a metal ballpoint pen with blue ink cartridge, offering a smooth and comfortable writing experience. Each notebook is meticulously and skillfully made to order, using a mix of traditional manufacturing and modern personalisation techniques. The perfect personal or corporate gift. Personalisation is free. To have your notebook personalised with your initials, name, or custom text, select a font from the drop-down menu and add your custom text in the box provided. Should you wish to submit your own Logo or Artwork, place the order and email us the image file along with your order number here. The leather cover comes with a removable soft feel A6 notebook which has 160 pages of 90gsm luxury lined ivory paper, a fold pocket in the back cover, a marker ribbon, and a handy elasticated strap. 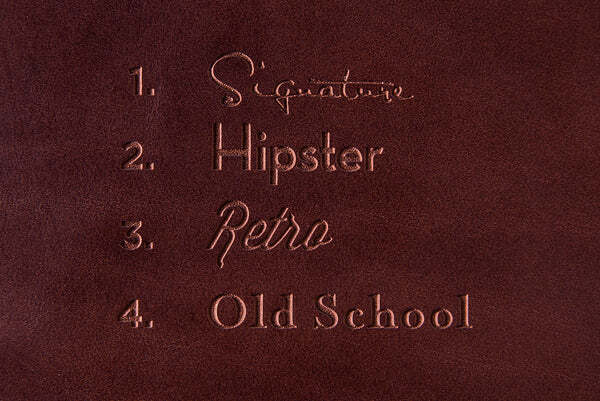 We've designed our leather notebook covers to specifically accommodate 93 x 143 x 20mm Silvine hardback notebook refills. These are available on our site here, or on Amazon and other major outlets. Refill sizes can vary slightly by manufacturer. Custom size covers are available on request.